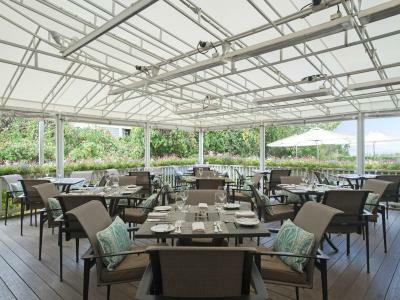 Lock in a great price for The Wauwinet Nantucket – rated 9 by recent guests! It's difficult to describe the relaxing atmosphere the Wauwinet exudes. By being located away from the town center, it's easier to focus on things like a beautiful sunset over the water and a crackling fire in the large fireplace. The staff was incredibly helpful and went out of their way to make the trip memorable by doing little things like the hostess speaking to the concierge about helping us get a great tour. 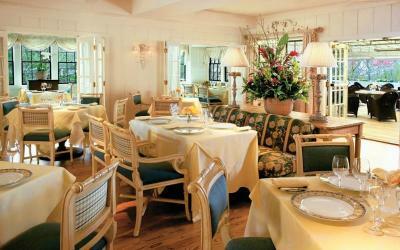 In addition, it has an old-time vibe (20s time frame) that is warm and welcoming. It is not your run of the mill hotel, but more of an experience. It all added up to a wonderful and luxurious time we won't soon forget. We had never stayed at the Wauwinet prior and after this visit, we plan to take a yearly pilgrimage if for nothing else than the fantastic sunsets. Your staff: most pleasant, helpful and responsive. The property has two amazing beaches and thus two different views to enjoy and two locations to experience. Lovely staff and superb service. My only issue is the check out time. 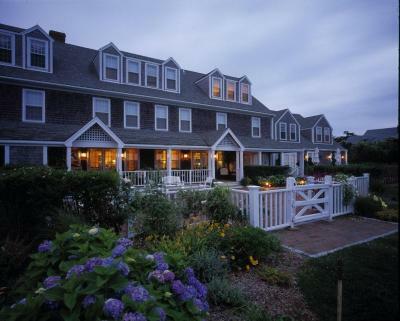 But I would highly recommend the hotel to anyone looking for a truly amazing stay here on Nantucket. It was great. This trip was our 32nd Wedding Anniversary. The staff went out of the way to make our stay wonderful. We didn't have time to do all the things they offered. Staff was excellent, facility is perfect for relaxing. Food was outstanding, Library had cozy fireplace lite, afternoon snack was great. Amazing views, fantastic location, boat ride to town is perfect! The staff was fantastic. The front desk was friendly and very helpful. Damien welcomed me "home " and I really felt like it was. The property was outstanding. Without leaving, you could have been happy with all that was provided. The service was totally outstanding, everyone was friendly, welcoming, and bent over backward to make our stay perfect. At the same time transportation to other parts of the island brimming with world class restaurants, entertainment, great museums and more was easy with the provided shuttle busses that ran every hour. 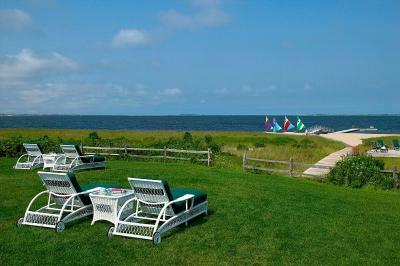 Staying at the Wauwinet is a wonderful travel experience in and of itself. And might I add both sunrises and sunsets are spectacular! The food was very, very good. So was the location, and the facilities. We had a wonderful night at this extremely comfortable and friendly hotel. It is in a beautiful setting and the staff have put a lot of thought into making your stay extra special. We really liked the hot cider and cosy fire burning on arrival in the sitting room. The cheese and sherry at 4pm was also a lovely touch. We also had a relaxing time watching the sun set on the porch with hot chocolates and rugs (October). Definitely recommend a dinner in the restaurant, it was absolutely delicious, the staff were very helpful, especially with the wine selection! 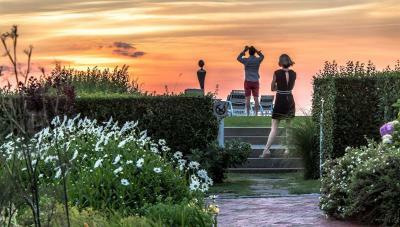 A great stay in Nantucket. The Wauwinet Nantucket This rating is a reflection of how the property compares to the industry standard when it comes to price, facilities and services available. It's based on a self-evaluation by the property. Use this rating to help choose your stay! 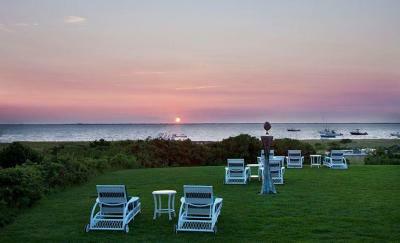 This luxurious Nantucket hotel features private beach access, as well as an on-site restaurant. Sailing and fishing opportunities are also offered. 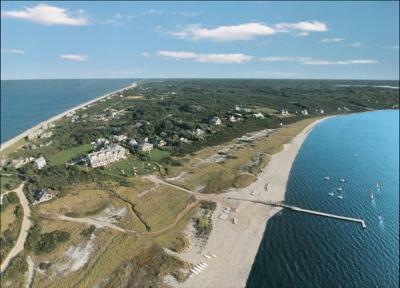 Nantucket town center is 10 miles away. 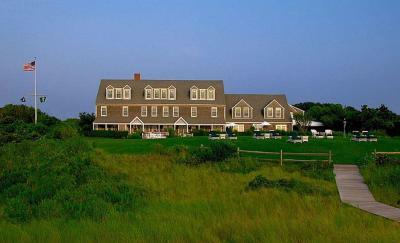 A flat-screen cable TV, free Wi-Fi, and an iPod docking station are offered at The Wauwinet Nantucket. Each guest room is decorated in bright colors and beach decor. Select rooms offer views of the Bay. 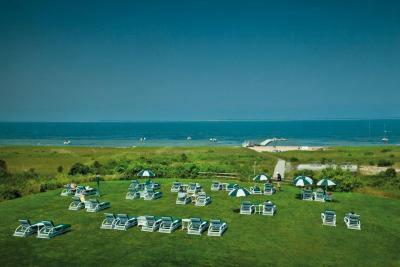 Guests can relax in the lounge chairs or visit the tennis courts at the Nantucket Wauwinet Hotel. 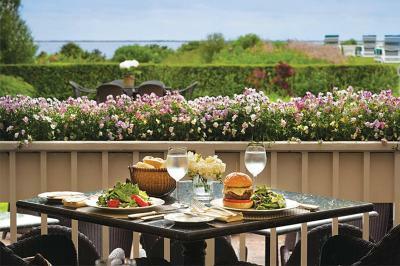 Topper’s Restaurant serves fine cuisine overlooking Nantucket Bay. Al fresco dining is available for lunch and dinner on Topper’s Deck. The Miacomet Golf Course is 13 miles away. The Brant Point Lighthouse is 12 miles from the hotel. This property also has one of the top-rated locations in Wauwinet! Guests are happier about it compared to other properties in the area. This property is also rated for the best value in Wauwinet! Guests are getting more for their money when compared to other properties in this city. When would you like to stay at The Wauwinet Nantucket? This room features a flat-screen cable TV and an iPod docking station. 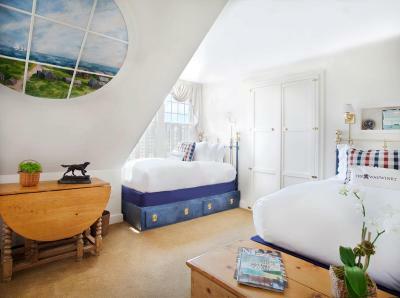 This room features views of Nantucket Bay, a flat-screen cable TV, and an iPod docking station. This suite has air conditioning, sofa and iPod dock. This double room features air conditioning, DVD player and cable TV. This double room has a iPod dock, DVD player and bathrobe. This suite has air conditioning, cable TV and bathrobe. This twin/double room has a DVD player, cable TV and bathrobe. This studio features a DVD player, air conditioning and iPod dock. House Rules The Wauwinet Nantucket takes special requests – add in the next step! The Wauwinet Nantucket accepts these cards and reserves the right to temporarily hold an amount prior to arrival. Everything was spectacular. No complaints or suggestions except keep doing a wonderful job! 11:00 am check out time given the hotels distance from any civilization. The breakfast waitstaff was not friendly. We had the complimentary continental breakfast (not worthy of this hotel) and were not warmly greeted when we sat at a table in the breakfast area even though it wasn’t yet open to guests ordering from the menu. The management should address this by welcoming all guests for breakfast rather than segregating the ones who elect the free breakfast. It’s unnecessarily awkward. What’s not to like? It’s everything you’d want and more. Staff were very pleasant, helpful!!! Nothing negative about the place. But I object to the lack of "spouse" as an answer option to the above review question - "who did you travel with?". My wife (after taking our marriage vows) of 32 years is more than just a partner. If this option is not added then this would be my last review on Booking.com. Carpet in our bedroom was really bad, a screen was sitting on the roof outside our window, our comforter was kind of weird. The hotel could have communicated more clearly what type of breakfast was included and what type wasn't included. Also, the background music was too loud in the dining room/deck. Room needed updating. Bathroom was poorly designed and had mildew in tub/shower area. Bed is way to high and I am 6'1". The meal at Toppers was not up to expectations, although the staff was wonderful. It may have been that the kitchen is still working out pre-season kinks. I cannot imagine how this could be improved from my standpoint. However, there are different kinds of travelers. Some may prefer to be in the midst of the hustle and bustle of a tourist town. This would not be for them. We prefer to be able to visit the hustle and bustle, but also to enjoy privacy, stunning natural beauty, and the peace of birds singing and waves rolling in.